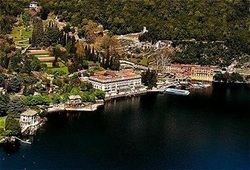 It was on the site of the Grand Hotel Villa d’Este that the Cardinal of Como, Tolomeo Gallio, built a fine house in 1568. Indeed, it was to here that Caroline of Brunswick-Wofenbuttel (the future Queen consort of Britain’s George IV) came in 1815. Treated with contempt by the establishment and her husband – though not by the people – it is said that her days at the Villa d’Este were amongst the happiest of her life. In 1856, however, a new building was constructed on the site, and by 1868 it had become the home of Empress Maria Feodorovna, wife of Tsar Alexander III of Russia, who rented the property for two years. Shortly after, in 1873, the private house was transformed into a hotel and it soon became a favoured destination for celebrities and the European royalty of the time such as King Leopold of Belgium, and Mark Twain. In fact, during the mid-twentieth century it had come to earn the nickname “Hollywood on Lake Como” with the likes of Douglas Fairbanks and Mary Pickford spending time in the house. Other famous names of the time that chose to stay include Greta Garbo, Bette Davie, Elizabeth Taylor, Clark Gable and Alfred Hitchcock. Today, the Grand Hotel Villa d’Este is, unsurprisingly, 5-star rated. Queen Caroline would no doubt very much approve.